Royal Carpet & Duct Cleaning has 25 years of combined expertise to serve all your carpet, rug and upholstery cleaning needs in Mississauga. Our highly proficient staff will remove all the stains and dirt from the interiors of home and workplace fabrics, leaving them looking and feeling extremely clean. Our cleaners provide Mississauga with numerous services at extremely affordable prices. Your carpets double-up as safe havens for tons of dirt and dust, attracting several bacteria and insects that lay eggs and feed on its fibres. Our carpet cleaners in Mississauga rigorously clean the carpets in your homes and workplaces to get rid of all the dirt trapped deep into its fibres. Regular cleaning the carpets help maintain their life expectancy and appearance. Rugs can be bought for an affordable price from wholesale distributors or for an expensive cost from speciality stores. Regardless of the amount you invested in purchasing your rug, Our cleaners are of the opinion that getting rugs cleaned should be affordable. That means we professionally clean your rugs to maintain its unique and chic appeal at a low price. Upholstery dulls and fades over time due to the accumulation of stains and grime. Our cleaners in Mississauga promise you a cost-effective cleaning that will leave your upholstery looking good as new. Experts at Royal Carpet & Duct Cleaning services are eager to assist all your cleaning needs. If an accident has left a stain or a spot on your carpet, area rug or upholstery, you can trust us to resolve the problem completely. We utilize non-toxic and easy-to-use cleaning products to cleanse, disinfect, and remove all odours from the affected area. Our cleaning methods also protect the colours and designs of the fabric. The drapes in your house act a gateway for the air that blows in and out of the windows. Drapery collects loads of bacteria, dirt, and dust all day. Simply vacuuming the drapes, unfortunately, fails to get rid of the harmful components. Our cleaners come prepared with heavy equipment and effective methods for extracting all harmful dirt from your drapes. The condition of ducts installed in your home dictates the state of the air we breathe. Inhaling impure air causes allergies and other health issues such as sinus attacks, headaches, respiratory issues, and irregular sleep patterns. Our duct cleaners utilize high-quality equipment to strip away all micro-pollutants from the ducts, clearing the pathways of air conditioners to push through the clean and fresh air. Solely cleaning your bedsheets does not ensure protection from harmful dust mites, allergens, bed bugs and bacteria. We professionally steam clean and sanitize your mattresses for your safety and well-being. Our cleaners have also mastered tile cleaning over the years. We remove all the built-up dirt and grout from your floors, prolonging the life of your tiles and making them look as good as new. We are also running a 24/7 emergency service for all your water or sewage damages and leaks. We arrive immediately to alleviate the stress of cleaning up your residential and commercial properties after water damage by taking matters into our own hands. We will effectively clean and sanitize the affected area. Simply call 905-595-0912 for all your water damage emergencies. Royal Carpet & Duct Cleaning experts are professionally trained and highly equipped to serve all your cleaning needs in Mississauga. 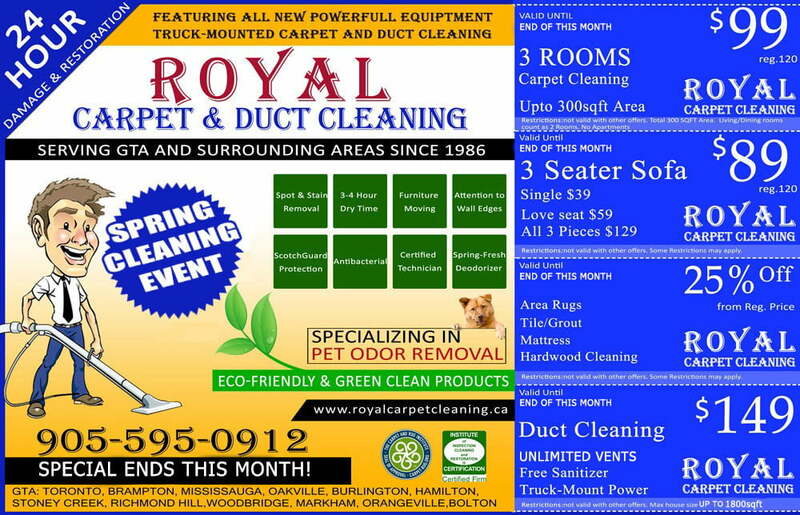 Visit royalcarpetcleaning.ca to read about all our services in detail. You may also call to speak with us at 1-855-438-7692.